Did you know that there are more bones in our ankles and feet than anywhere else in our body? This is why sprains and fractures can be so painful and debilitating – and why foot health is so imperative. It is also the reason why the recovery from a broken ankle can be a long and precarious process – there is a high risk for re-fracturing the ankle. If you are an athlete or spend a lot of time on your feet and legs, it is especially important to be careful during the recovery time. However, this doesn’t mean you can’t take certain measures to speed up the recovery time. Here are five tips for speeding up broken ankle recovery time. Stay off your ankle as much as possible. The moment you place your foot on the ground, you are increasing the risk for lengthening your recovery time. This is why you want to get crutches immediately after you get bandaged up. The more time you can spend off the affected ankle the better. If your doctor has a prescribed recovery time, you want to be sure to stick to using your crutches until the very last minute – you don’t want to cause complications towards the end of your recovery. Limit mobility of the ankle. Even if you have crutches, you could still risk your ankle moving, which can be painful and increase the time it takes for your ankle to heal. This is why you want to bandage your ankle properly. If your ankle is severely fractured, you’ll want to use a cast. The goal is to prevent your ankle from twisting or moving, which could happen involuntarily in your sleep. In most cases, when you visit a specialized medical center like Advanced Foot and Ankle, your doctor will make sure to bandage your ankle accordingly. Reduce swelling. Swelling is the enemy to recovery when it comes to ankle fractures. This is why you want to place ice packs on your ankle. Ideally, you want to place ice on the affected area for up to thirty minutes – three or four times a day. You could also visit a pharmacy and pick up a special ice pack that you can wrap around your ankle, which makes icing a lot easier and more comfortable. Keep your ankle elevated. Another way to reduce swelling and speed up recovery is to keep your ankle properly elevated. When you have a broken ankle, your body will do everything it can to send fluid and blood to the area. However, this can cause uneven circulation and it can make the pain worse. 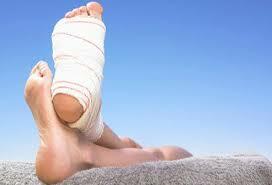 Ideally, you want to use a few pillows to elevate your ankle, which can be done comfortably in bed.